We have a weird schedule because he goes to work at 7pm and comes home at 4am. He usually tries to have a nap before going to work but seems to think as long as he is in bed that it counts as a nap. If you are on the phone…. it doesn’t! He has such long phone conversations too. Always on the phone. That’s one of the ways I’m exposed to the Korean language, because he is always talking to someone. But for me, I actually hate talking on the phone. Is anyone else like that? I don’t really enjoy long phone conversations. I’m also a lot less social than my husband though. He is a social butterfly but I have a more select group of friends. I can be really social in the right situations but he is better at adapting in any situation. What?! Yes he has a flashing cube. Because that’s what you want flashing under your bed at 4:30 in the morning… He got it from work when he was working in the night club area. He doesn’t usually work there but he made sure he did because Psy was performing that night. They put these cubes that light up in the ice when serving wine apparently. Side note on Psy: This particular night club really promoted Psy being there. But it really was only an “appearance” which usually just means something short. Unfortunately many people thought it was more than that and paid ridiculous amounts of money to see him (when they could have just gone to the free concert that Sunrise did) and he only did Gangnam Style. It’s a shame because there were disgruntled fans but really it wasn’t Psy’s fault but there were people blaming him. I think it was a combination of it being promoted the wrong way and people not reading properly and not understanding that it wasn’t a concert. My husband is just happy he saw him after missing out the other day… and for free! Later after the performance he could walk past Psy in the VIP area but he was too shy to say anything to him. Do cubes remind anyone else of that recent Doctor Who episode? I hope they don’t start appearing everywhere. I’ve been asked a lot lately about how and why I make comics and I thought today I’d share the longer answer. The short answer to the question of what I use to draw is that I use a Bambo Manga Pen and Touch Tablet. The answer for the questions like how and why I started it are a lot longer. I worked as an artist from the time I was about 16. I painted. Mostly realism, a lot of landscapes. I exhibited where I could, had minor exhibitions. I painted a lot in a studio with other artists. Here are some examples of the type of art I did. I loved being creative and painting but unfortunately trying to earn a living from art eventually sucked all the enjoyment out of it. I felt trapped. People would tell me I was talented and made me believe that I was doing what I was supposed to be doing and I tried to tell myself that this is what I wanted. Actually I was miserable. Looking back, I don’t like the person I was back then, and it was a struggle to be happy. I had a scholarship to a prestigious art school but felt lost when I attended. I hated dealing with competitions and gallery owners and all the pretentious aspects of the art world. The worst was my self worth hinging on whether or not I sold a painting. So I eventually, after many years, I quit. I went back to studying (things other than art), I moved, I started enjoying life a lot more. I didn’t have to be a tortured artist anymore. Eventually I met my husband as well. Earlier this year I started thinking about doing something… I wasn’t sure what. I still had a desire to be creative but I never wanted to go back to painting big artworks like before. 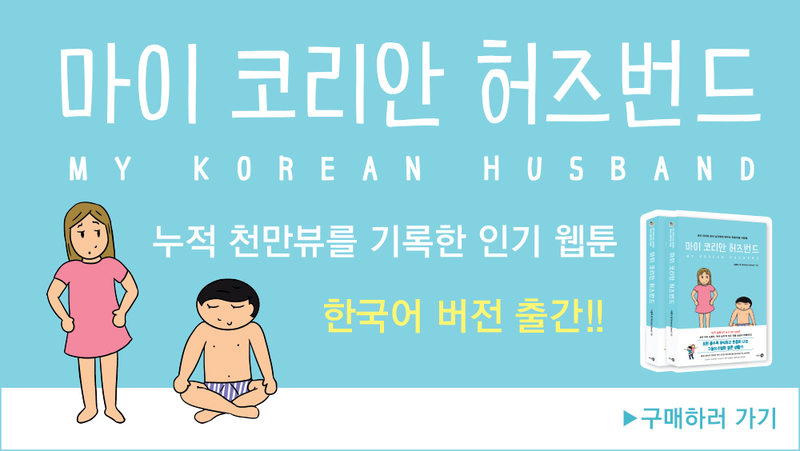 I also felt I had a lot to share about my experiences with Korean culture and my husband. I had been watching Simon and Martina from Eat Your Kimchi on youtube and I really loved their videos where they talked about living in Korea and cultural differences. They really inspired me. I also realised there were many people also interested in Korean culture. While I don’t live in Korea at the moment, through my husband and friends I’m exposed to Korean culture and realised I also had something to share. Not only that, but my husband is pretty hilarious. Pretty soon I had many ideas in my head that I wanted to express and came to the conclusion that maybe comics were the best option. You might assume that with a background in art that comics would be easy right? They really aren’t… When I painted before I always had a reference, whether it be in front of me or from a photo. I was interpreting something I could see. For comics I quickly realised I had to draw something straight out of my head. And that can be pretty hard. Even as a kid I wasn’t really the type to make up cartoon characters, I mostly drew realism from references. So when I started drawing comics it was like learning how to draw again. Also, with painting I’m a perfectionist, and I guess if I wanted to I could spend weeks on one single comic. But I made a decision early on that I’d update my blog regularly which meant I had to relax and not worry about drawings not being perfect. I used cheap watercolours and pens in the beginning. I had a friend set up my website for me- I don’t really know much about making websites. Thank God for WordPress. As I gradually got more readers I decided I needed an easier and more professional looking way of making comics. The problem was that all my art experience was very traditional and I didn’t know the first thing about digital art. I still don’t know much. I ordered the Bamboo Manga tablet from Wacom as it was only $140 and seemed best for my needs. I tried it out as soon as it arrived. That didn’t go so well… I kept drawing and painting on paper and scanning the comics for a while. Those that were reading my blog back then might have realised it took a while before I started uploading comics I drew on the tablet. I was frustrated at only having a completely traditional background in art and the tablet scared me. I forced myself to get used to it and now it’s a great way of making a comic very quickly and very easily. I’m still a complete novice at digital art but I’m learning. The biggest difference is how I feel about my art now. I may just be making crappy little comics but they mean more to me than the biggest and most detailed landscape that I did before. And I’m happy making them. Before it was a struggle and I had to force myself to paint, I was racked with guilt because of the pressure put on me to use my ‘talent’, but now I happily draw almost every day. I have done a few painting commissions in recent years and don’t mind painting now but I still never want to go back to it full time. I express myself in other ways now as well, not only drawing comics but through things like writing and cooking. I’m thinking about starting another blog soon, while continuing this one of course. It would still be comics but more general and random comics. I have so many stories from my childhood I’d like to turn into comics as well as weird stuff that happens these days. There are a lot of stories that involve my siblings, who I’m still close to. (Some of you may have realised that my brothers sometimes pop up in the comments sections here as well). So that’s my story about how I became disillusioned with art and felt anxious and guilty at not using what people thought was my talent, to eventually coming back to it in a different, happier way. And that’s why I draw comics. I’m just really happy that I have people commenting and liking my blog at all! I only started it in April and already it has surpassed my expectations AND I get to interact with people all over the world. So I have stopped him from looking too much. He has his own blog to work on, he should be doing that instead! My interpretation of something he told me yesterday. I had to point out that it was kinda hard for his friend to say hi when he is hiding from him!